banaras ka khana: Rose cafe : a review | pretty pinks don't make good people, or good food for that matter..
Rose cafe : a review | pretty pinks don't make good people, or good food for that matter..
We entered a nice cheerful looking place called Rose cafe last Sunday, the autumn sun was not very pleasant at that time of the day and the interiors felt really impressive and cool. Very English-French design elements that disconnects you from what is happening on the mundane road outside. We were a cheerful lot ready to have a good time. 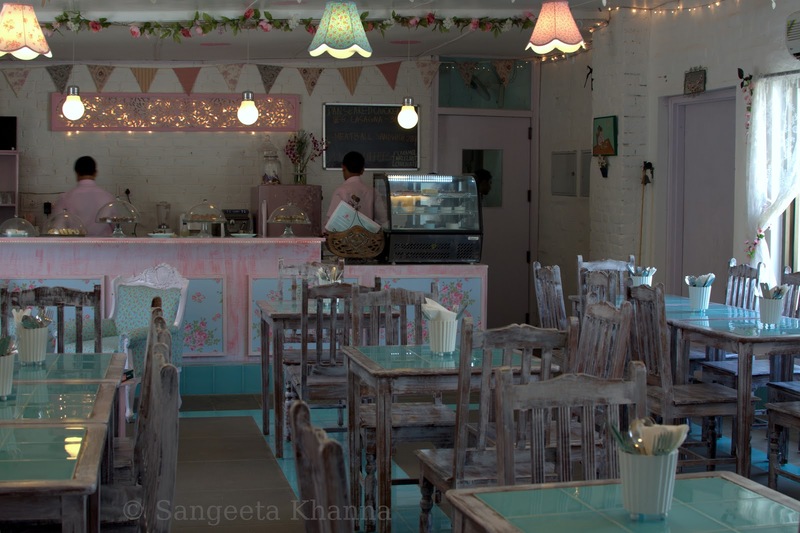 We the blogger friends of Delhi were invited for a review of this cafe.We had decided to visit this place because Ruchira had enjoyed her pizzas and mezze platter here sometime back when she had been there for tasting . The Cafe was not open for public then apparently. The pink and turquoise interiors won me over almost instantly. We were the first patrons to arrive in the morning and it looked like a well lit place with large glass windows with lace curtains nicely tied with twiggy roses. I was so impressed by the detailing that was evident in the hand painted doilies , the lampshades, the fairy lights here and there, an open counter and fake patina furniture. The tables inlaid with turquoise tiles look neat, the florals used all over paint a pretty picture. Pretty. Later we found out how deceptive. The place got a bit congested later after most of the tables were occupied as there was no walking space left when chairs were drawn out..
We all arrived one after the other and we settled down to start our brunch. We ordered our drinks and a confused, lousy service couldn't dampen the lovely lemonades and iced teas. We are a nice lot and ignore a few lousy faces of people serving food to us if the food is making us happy. A salad pizza came and then a sour cream and bacon pizza, we liked. The drinks were being haphazardly plonked onto our tables, and a few orders were forgotten , some others delivered twice. We were still very patient, Ruchira's face getting tensed as the food was not the same as she had tasted last time. She was expecting better this time for an invited audience, feeling embarrassed for the lousy service herself, the nice girl she is, thinking it was on her recommendation the group of bloggers had gotten there. In between there was a Shepherd's pie that arrived very late but saved the grace for a while as everyone liked it. A baked bean served inside a hollowed bun was nice, a double cheese chicken was disappointing. Panko fish fry was just average. Those iced teas and lemonades were good company but lemonades don't make food. Did I tell you we share or plates many a times? Yes we do. That's why we were so patient even after late deliveries of our orders as we kept sharing whatever reached the table. And the brunch experience started getting worse, a few of us were never delivered what we ordered, some starters getting on the table after mains and one Jacket potato being served in the middle of desserts. The Aubergine parmesan was yuck. All the desserts, including the coconut macaroons, the lemon cake and the strawberry layered cake were frozen and cold, I fail to understand why. You can't imagine how a cake is dead when frozen and a coconut macaroon tastes like plastic if hard, if you haven't eaten a frozen cake or macaroon in your life. We just experienced. Only the Espresso streusel was good. Actually very good. We did hint them about the misplaced, delayed, repeated orders and the hair in the glass of water and were met with sleepy response by the servers. An owner who forgot she had invited a large group and a very rude consultant Chef could not keep the pink and turquoise pleasant anymore. Very sad. We left disappointed and sour about a wasted Sunday. Would I recommend the place? Yes if you are alone and want a quick refreshing iced tea or a dating couple and wont mind the late service or the taste of food. A big NO if you want to have a good time with friends and family expecting some good food served efficiently. yeah....you are totally right in the roundup..only for a glass of iced tea maybe..not for a meal!! I agree. What a sordid experience that turned out to be. Leave alone the food, even the staff were walking disasters!